Cat. lagosta, llagosta, L. Palinurus elephas, Eng. 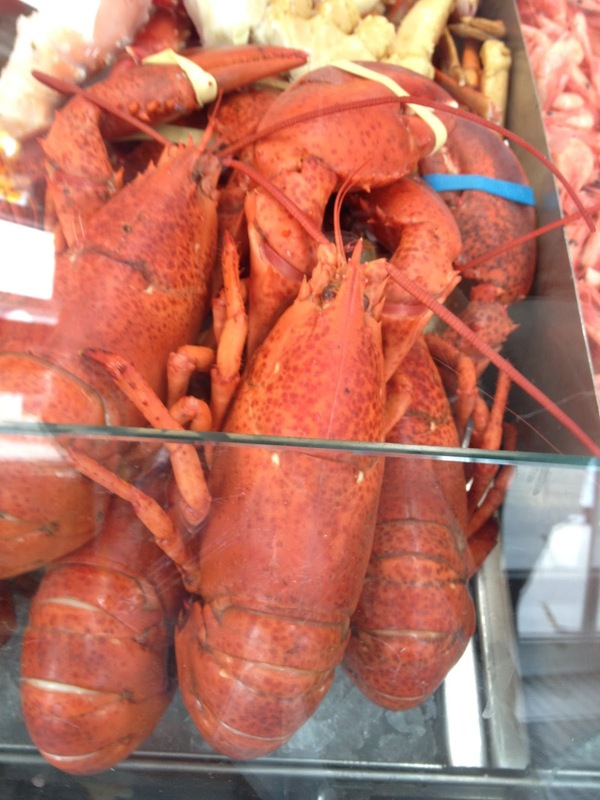 lobster, European spiny lobster. 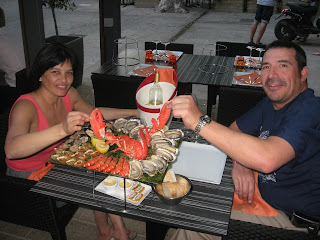 Of the five lobster species, it is the most frequently caught in and around Spain. It originated in England and today is found on the coasts in western Scotland, SW England and Wales, western Ireland, Norway, France, Portugal, Spain, Italy and Turkey. In Spain, it is prevalent in Galicia. It lives exposed on coastal rocks. Although some are purple, brown or tan, most are orange. They are covered with spines on the abdomen and bigger appendages, have two heavy, spiny antennas longer than the body and the two front legs are hooked like claws but do not have pinchers as other species. They can grow be 60 cm long. 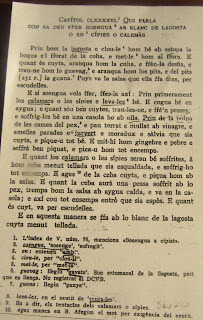 Of the other four species, three were caught in Galicia during the Middle Ages, as today, which are the European lobster (Sp bogavante europeo, L Homarus gammarus), the crayfish (Sp. cigala, L. Nephrops norvegicus) and the pink spiny lobster (Sp langosta rosa, mora or africana, L. Palinurus mauritanicus). The European lobster has big pinchers on its front claw, while those of the crayfish are thinner and larger. The pinchers of both are tougher to break than other species. They have two pairs of antenna on the head and a fan-like tail. Spiny female lobsters lay thousands of eggs every other year. When tiny they let the tidies carry them and they swim as well. When five weeks old, they go to the bottom of the sea. As they grow, their shell changes. They can live up to 50 years. Crayfish are found off the coasts of Iceland, Scotland France and Spain. During the Middle Ages, Spaniards also ate two African species of lobster caught on their coasts. The first is the pink spiny lobster, which is lighter in color, bigger than common lobsters and its antennas are spinier than others. The majority of smooth tail spiny lobster or cape rock lobster (Sp langosta verde or langosta del cabo L. Jasus lalandii) is caught off Cabo Verde and Mauritania. This lobster is green and the lateral bands on the tail and body are lighter. According to Avenzoar, Muslims refused to eat lobsters as the thought they would die if so. 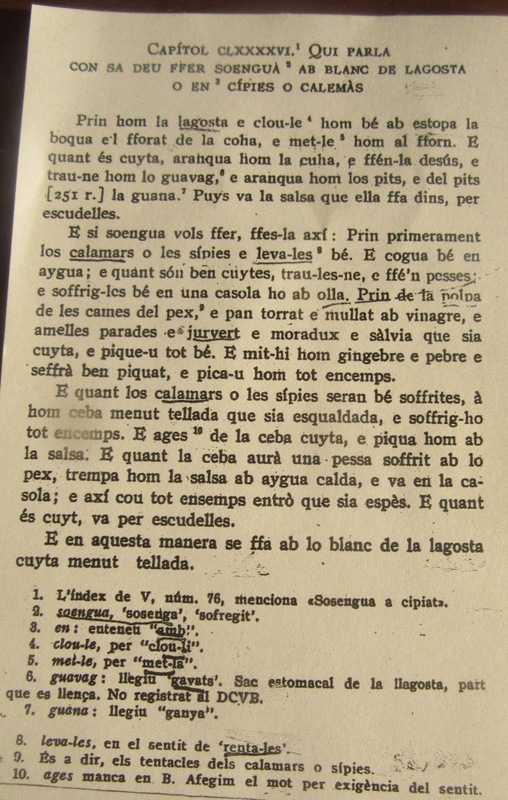 Africans and Iberian Christens ate them boiled, fried and other cooking methods. Avenzoar claimed that lobster was harmful for people with a hot nature, those with phlegm and those with humidity in their bodies. Some eat pickled lobster in vinegar, which is less noxious. When eaten as a meal the blood starts to burn and this causes bad things and illnesses. Place the lobster in boiling water and cook about 15 minutes. When cooked, remove it and extract the tail. Open the part underneath with scissors or a knife and remove the meat and set aside. Put all the creamy parts in a saucepan like the stomach etc. and the water or juices. Slice the cuttlefish and cut the squid into rings. Blanch them in boiling water for ½ minute. Put oil in a saucepan and when hot add the calamari and cuttlefish to gently fry them. Add finely sliced onions. 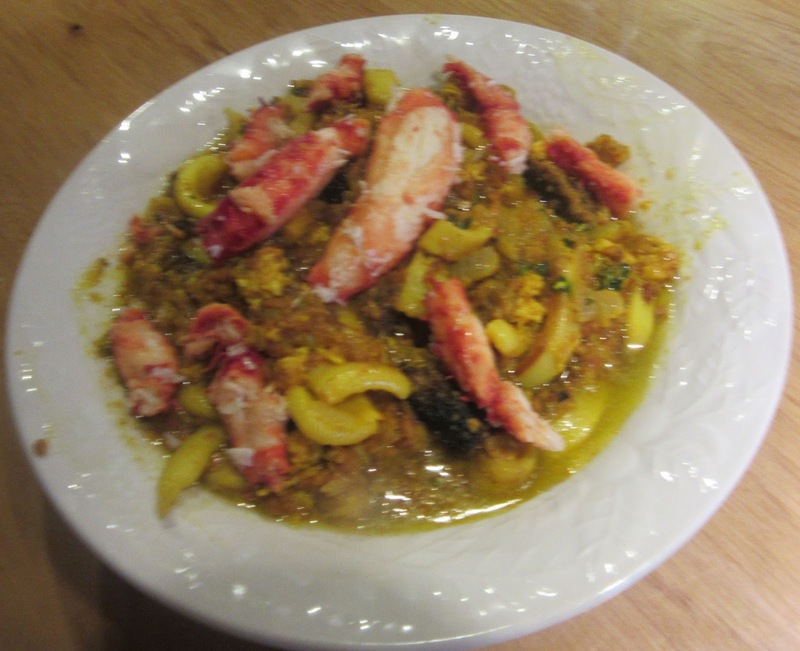 Chop the meat from the claws of the lobster with the almonds and herbs. Add the spices and bread soaked in vinegar. Mix all with a little water and add this to the saucepan with the onions and fish. If the sauce is too thick or dry add a little water. Salt to taste. Serve in bowls with the juices and creamy parts that were saved. Serve garnished with dill and with pieces of toasted bread and alioil. See blog titled bullabesa published May 14, 2012 for a different version of this recipe. Canned crab was used instead as the dish was made in a month not ending in "r", which is the mating season for seafood in generak. For recipe see blog titled allioli published on August 4, 2011.